Ben McKenzie talks about the "Bat/Cat" happenings in the Gotham episode "One Of My Three Soups"
Batman and Catwoman. It’s been a cat and mouse — err, bat game for the duo since she first appeared in comics nearly 80 years ago. In the pages of DC Comics, the pair are soon to be married. On FOX’s Gotham, they’re still a pair of teenagers, as played by David Mazouz and Camren Bicondova. Their Gotham co-star Ben McKenzie directed this week’s installment of the show titled “One Of My Three Soups” and at a Q&A earlier this week, we asked him about directing some key “Bat/Cat” moments in tonight’s show. WARNING: Spoilers for the March 29 episode of Gotham are being discussed within. 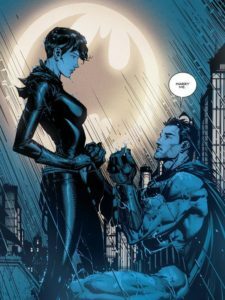 “It was in the script, obviously, but I specifically wanted to lean into how much we, as an audience, want them to figure it out,” McKenzie said of this week’s happenings between Bruce and Selina. “We want them to be able to have these tender moments of affection. In the scene in the diner, when she comes in to save him and she tries to kill Jerome, and he jumps at her rather than allowing her to do it and they ended up on top of each other, that was a shot that was very important to me, because it’s very much the archetypal shot of a tender moment between two potential lovers, and they were game for it,” McKenzie continued. “They have grown a lot in four years, and to watch them come into themselves, and be able to use that to bounce off of each other, was really rewarding. So what I’d like the audience to see is that there’s a real tenderness there between the two of them, and at the end, when she basically says ‘Fine. You’re gonna have to live your life, but don’t get yourself killed,’ you can tell that she really, genuinely cares for him, and we spend a lot of time talking about that, and working on that,” the director shared. Gotham airs Thursdays at 8PM on FOX. Come talk about the series on our Gotham discussion forum!